m on the side » The Chen Sistahs’ Spring Cleaning Giveaway! Home > m chen wears	> The Chen Sistahs’ Spring Cleaning Giveaway! The Chen Sistahs’ Spring Cleaning Giveaway! This contest is now closed. Congratulations to our six winners! Thanks to everyone who entered. My big sis Serena and I are on a bit of a high these days for plenty of reasons — we’re just a little giddy from all this nice weather lately, we’re both gearing up for our birthdays (just one day apart at the end of the month), and we’re each drumming up new designs for the summer. So in the spirit of Spring cleaning (read: freeing up some space to make way for new stuff to come), we’re having a giveaway! 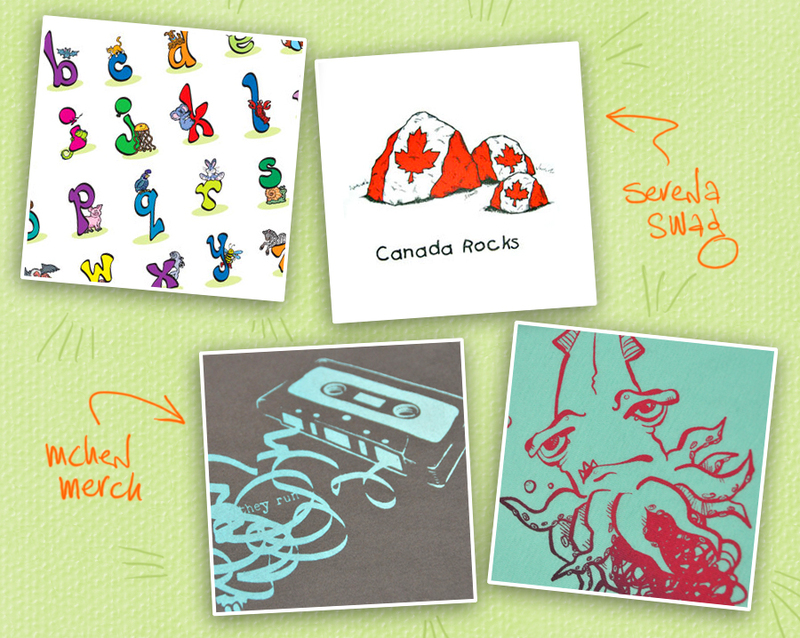 Any shirt available in my shop (three prizes total). We’re each contributing three prizes… so if the first three winners choose items from Serena, then the last three winners will get their choice of items from my shop — or vice versa. Leave a comment here letting us know which item you’d choose if you won from either Serena’s site or my shop. For an additional ballot: blog about this giveaway — include a link to the post. For an additional ballot: Twitter about this giveaway — include a link to the tweet. Entries can be submitted until Monday, April 27th, at 11:59 PM EST. We’ll do the draw on April 28th morning (the day between our birthdays) and announce the winners here. Good luck! Please make sure to include a valid email address to reach you if you win. Winners will be notified by email and will be given three days to respond. For any winner who does not respond within that period, another winner will be chosen. The Chen chiquitas say: thanks so much for partaking! m on the side » Winners of the Chen Sistahs’ Spring Cleaning Giveaway! Bye bye Wii… it’s been fun The cucumbers are in the lead!